Henchbot this ones for the hippies in my bee class, esp the one who wanted to use incense sticks instead of a hive smoker. hahahha loser! Jay Reatard – "It Ain't Gonna Save Me"
Henchbot its 5pm. Im STILL hungover. hello world. 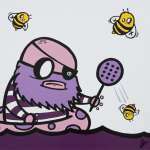 Henchbot Its a Nickatina kinda day..